Black Tuesday at the Koi pond. In the last few posts I have talked about losing some fish and the challenges of fighting diseases in a pond. This makes it a risky time in any pond, but more so when the temperature is changing. Two fish have died (Rhu and Patty) and the disease has progressed to others in the pond (Tawney). Summer is also a time of vacations and travel. Traveling while treatment is progressing is also very risky. Treatments usually occur over many days and things can change wildly over that time. Symptoms can worsen and new symptoms may appear which may require changes in your treatment plan, all the while you are gone. Plus putting such pressure on friends or neighbors who are feeding the fish is just not right, or productive. Unless they are familiar with Koi, they will not be in a position to help with the treatment process. At the Koi Garden pond we had just that happen: a vacation was planned for a long time and I had to leave with a treatment plan partially completed. The other thing that complicated matters is a heat wave in Seattle that raised the temperature over 90 degrees. The higher temperature changes the water chemicals very quickly and can cause additional problems. The treatment did not go as I had planned or wanted. We had enlisted friends to review and feed the fish while we were gone. But the higher temperature caused green water which obstructed any views of the fish, so health problems could progress… Because they could not see the fish, they assumed that things were hunky dory. Returning from a week long vacation to find all the fish dead is a bad way to return home. 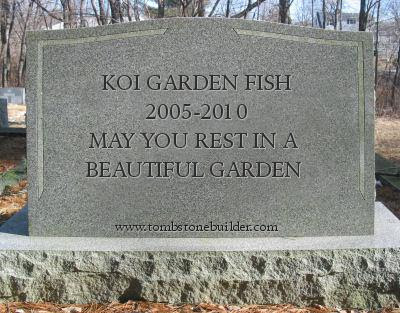 This is a sad time at the Koi Garden. I will have to spend some time thinking about how to progress with the pond. We cover everything about building and maintaining a Koi pond and garden. I will cover the garden, the Koi fish, photographing them, and the tasks required to provide them a nice place to live as the seasons turn. Take part in it!! !